Explore our section of basic volleyball rules to get simple definitions of rules. In this section we give you the basic idea of the volleyball rules. This rule page includes the very basics of volleyball rules for beginning volleyball players and fans. To get more complete explanations about the libero and other recent rules changes, be sure to check out our other rules pages. In volleyball rules cases section, we present real volleyball game scenarios, which will help you to use rules to your advantage and become a better player. Share YOUR Experience! 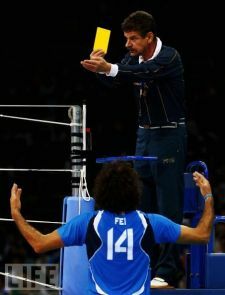 Post your question about volleyball rules in the bottom of this page. Share your experience and answer the question. Add comments. Let’s make the forum Q/A valuable for the community. Team has 6 players on the court. 3 players are front row players and 3 of them are back row players. Team is allowed to use a libero player (back row player, defensive specialist) who wears different color shirt. Back row players can not attack the ball front row. If they attack, they have to perform the jump behind the attack line (10 feet line, 3 meter line). 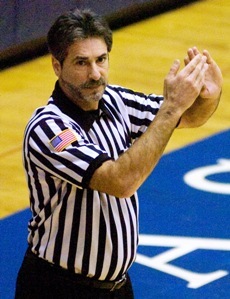 It is ALLOWED to play the ball off the net. It is a fault, if the ball contacts net outside antennas. The ball has to travel between the antennas (or the imagined extensions of them) when flying to the other side of the net. of it hits the lines. Players are NOT allowed to catch, hold or throw the ball. 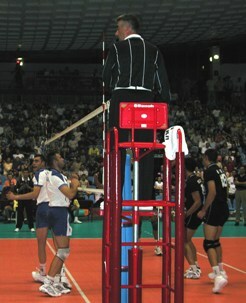 Players are NOT allowed to hit or block the opponents serve. Attacking ball which is coming over the net is ILLEGAL, if it has NOT broken the plane of the net. In other words the player is ALLOWED to swing the ball when it breaks the plane of the net. Let serve is allowed. In other words the ball can touch the net on the serve. digging it. Kicking is allowed. A point is followed after each serve. (Earlier you had a chance to get a point only after your own serve). One of the back row players can be substituted to a libero who is a back row specialist with unlimited subs. 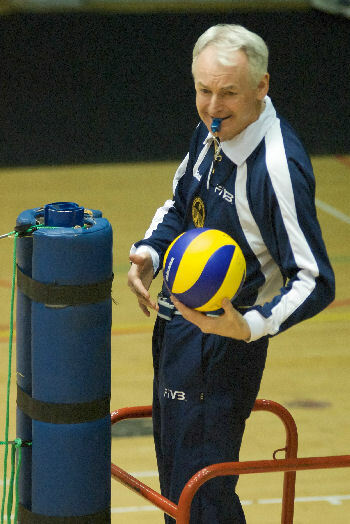 The libero can enter and exit the game between each serve without coach requesting a sub. Stepping on the back line when serving the ball. How to Use Rules of Volleyball for Your Advantage? To read about how to use these basic volleyball rules to your advantage in the match, click the following link. These rules of volleyball give you understandable descriptions and help you to use rules for your own benefit on the court. Find questions and answers related to volleyball rules. Have A Great Question or Story About This Topic? Have a question, concern or comment about this? Enter Title of YOUR Question. "Ex. 'What is a double contact in volleyball?'" Explaining basic volleyball rules that have recently changed. The official volleyball rules in easy to understand format. Basic information about playing positions and rotational positions. What are the different volleyball playing positions? Learn basics of volleyball rotations. Volleyball court positions information - how to line up on the court? Learn the basics of volleyball 6-2 rotation. 6-2 volleyball rotation details. Learn players' positions on each rotation. Read about proposed rules for volleyball. How the game could be changing soon? Volleyball Rules Cases - How to Use Rules for Your Advantage? Playing the ball above the net. Blocker vs Setter. Blocker vs. Attacker. Libero attack. Setter vs. Blocker. Tips for the Setter. Double Contact on Volleyball Setting.